How’s that for poetry? It was inspired from one of my kids’ books which I read to them each night. But this article is not about poetry…Well, perhaps it is…maybe you could call it “poetry in motion”. 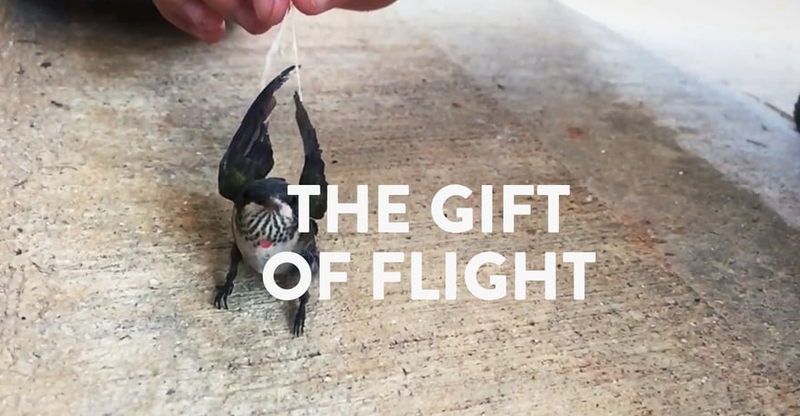 That is what occurred in our garage a few weeks back, “The Gift of Flight”. I had come home from work and heard a faint noise as I walked through the garage into the house. Not thinking too much about it, because like many of you, the garage is where strange noises and junk live and it’s not uncommon for a bird, bug or other woodland creature to pay a quick visit only to quickly vanish and move on to other adventures. However, this noise persisted and eventually I decided to drag myself off of the couch to investigate. When I opened the door, I immediately noticed a small hummingbird trying to find its way out. The garage door was up and it was hovering at the ceiling unable to leave. It was as if we had invented our own little hummingbird fly trap. As I was thinking of whether or not to get a broom or a fishing net to shoo it out, our little visitor took a left hand turn up to the highest storage shelf and sat there perched as if to rest a little bit before it began another feeble attempt to escape our garage of no return. But before it could fly again, he got caught up in some cobwebs towards the corner and tumbled to the ground, hard. As it happened, my boys wandered in from the yard. Their natural curiosity got the most of them, wondering what their Dad was doing grabbing brooms, nets and talking out loud to someone or something. I have three kids, and my two boys, 7 & 9 were outside playing football at the time. One son in particular, our 7 year old is always interested in capturing a lizard, frog or anything else that dares cross his path. He has a gentle soul and if not for his desires to one day play professional sports or be a home builder (his words), I could definitely see him as a zookeeper or an anthropologist because of his intense fascination and love for animals and reptiles. The bothers quickly assessed the situation and with a little instruction from me, understood the need for them to help this now flightless bird. This was perfect for me (well, I felt bad for the bird, but it presented an opportunity at the same time), as I was growing tired of trying to figure out how I was going to free this hapless hummingbird that had already taken up more of the time I was initially willing to give it. I went into filmmaker role, a position I am much more comfortable in taking. Remember the (ah-hem) beautiful poem that I began this post with? It’s for instances like this, that I love the fact that in my pocket, at all times, I have one of the finest video recorders there is. The iPhone. Knowing in the back of my mind, that should this be a successful rescue of the bird, it would be flying away at breakneck speed, I switched the settings to slow motion so as to record the action in 240 frames per second. Lucky for me, all I had to do was hit record, make sure I held the camera as steady as possible and give words of encouragement to my boys that they shouldn’t be afraid of the bird because they were there to help the little guy. There’s no real need for me to describe the steps of what we went through piece by piece anymore because what you’ll see on this video explains it all. We as parents are constantly guiding our kids, especially rough and tumble boys, that there’s a time and place for everything. Playing rough, wrestling, going through their childhood at full speed and trying to one up the other with their latest bathroom humor joke is their daily ritual and it’s awesome to watch. But, what really warms the heart is to see how they can switch from tiny gladiators to young, caring and compassionate little men, understanding that the most vulnerable (whether it be a person or a tiny animal) sometimes desperately need their help. Way to go boys! Your dad is very proud of you! Now go out and play your little hearts out! For more of my videos, check out my Vimeo page.